Most people picture Mt. Everest when they think of the Himalayas, but the mountainous region contains a wide variety of habitats, including grasslands, jungles, and coniferous and broadleaf forests. Five species in two subfamilies of the Cercopithecidae monkey family, macaques and langurs, live in the 1500-square-mile mountain range, which covers parts of India, Pakistan, Afghanistan, China, Bhutan and Nepal. Rhesus monkeys (Mucaca mulatta) are the most common monkey in India, and live in the Himalayas at elevations up to 8,000 feet. The red fur on their rumps distinguishes these monkeys from the other macaque species in the region. Males grow to about 2 feet in height and weigh around 20 pounds; females are slightly smaller. They tend to stay at lower elevations during the winter months, but venture higher during the summer in search of fruit and plants to eat. While rhesus monkeys are frequently found near human settlements, assamese macaques (Macaca assamensis) prefer denser forests between 2,000 and 6,000 feet above sea level. During winter, they rarely travel lands higher than 4,000 feet in elevation. Assamese macaques are slightly larger than rhesus macaques, making them the largest macaque species in India. They live throughout the Himalayas and share many behavioral traits with the rhesus macaque though they are generally less aggressive. In 2004, scientists exploring the remote state of Arunachal Pradesh in northeast India discovered a primate previously unknown to science -- an animal they’ve named the Arunachal macaque (Macaca munzala). These short-tailed brown monkeys may have been unknown to Western biologists, but they are quite familiar to local residents. Primatologists are still learning more about these “new” macaques, which live at elevations of 5,000 to 11,500 feet, making them one of the world’s highest-dwelling primates. The common langur (Presbytis entellus) lives throughout the Himalayan mountains, at elevations as high as 11,000 feet above sea level. Also called Hanuman monkeys, these have pale heads and darker bodies than langurs living elsewhere in India. Those individuals living in higher elevations tend to have longer and thicker fur than those closer to sea level. 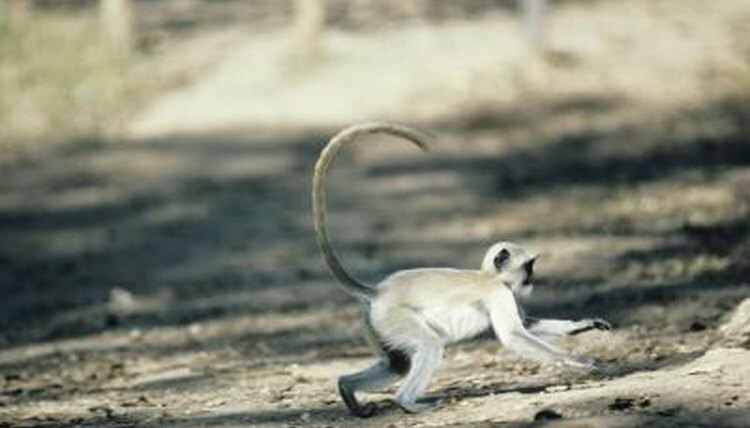 Langurs eat plants and fruit as macaques do, but they have adapted well to living around people, are less aggressive and are not known to raid agricultural crops. Named for its cream-colored fur, which looks gold in the sun, the golden langur (Presbytis geei) lives in the jungles of the eastern Himalayas.These elusive vegetarian monkeys make their homes in the middle elevations, between 6,600 and 9,800 feet above sea level. The largest populations of golden langurs are restricted to a nature reserve that crosses the border between India and Bhutan.